An automatic cleaning station can be the ultimate step toward a completely fuss-free shaving experience. And in the case of most Braun electric shavers, the station is a necessary evil since the shaving heads (cassettes) are notoriously difficult to clean manually. The cleaning fluid in Braun’s clean & renew cartridges also lubricates the foils and blades of your shaver, prolonging their lifespan by reducing the friction and heat during use. For these reasons a Braun cleaning station is genuinely useful and a must have in my opinion. However, in order to enjoy your squeaky clean, citrus scented shaver, you’ll have to constantly shell out your hard earned money on new refills. And Braun’s clean and renew cartridges are pricey compared to the ones from the competition and also need to be replaced sooner than other detergent-based solutions. In this post I’ll present you 3 actionable tips that will make your Braun cleaning cartridges last longer so you can save money and continue to enjoy shaving. 1. Take out the cartridge and put the plastic cap back on once the cleaning process has ended. Unlike other electric shaver brands that use detergent-based solutions, Braun’s cleaning fluid contains alcohol (ethanol or isopropanol). Alcohol tends to evaporate a lot faster and while this can be an advantage as it takes less time for the shaving head to dry, it also means that the cleaning fluid inside the container will evaporate faster. Luckily, this can be easily fixed. After the completion of the cleaning cycle, pop open the station, carefully slide out the cartridge and firmly press the plastic cap back on. Then store it in a safe place until your next shave. Note: certain Series 7 and all Series 9 cleaning stations are fitted with an active drying system (induction heating or a fan). In this case you should remove the cartridge after this drying phase has ended. Braun recommends removing the cartridge if you won’t be using the station for a long time, but I actually recommend you to do it every time if you want to get the most out of one cartridge. Even if you use the station daily that’s still 24 hours in which some of the alcohol-based fluid will naturally evaporate. So make sure not to throw away the plastic cap when you install a new cartridge. 2. Remove the bulk of hair strands from the shaving head before using the cleaning station. The foils and blades of your Braun shaver are merged into a single piece called a cassette. It has a very intricate inner part that makes cleaning very fiddly and tedious and you can never get all the clippings and dirt out. However, removing as much as you can prior to using the station will definitely help us achieve our goal of squeezing more cleaning cycles out of one cartridge. Once you’ve finished shaving, remove the cassette and very gently tap it on the edge of your sink or counter-top. You should only tap the plastic frame, never hit the foils as they can be damaged easily. With the included brush you can also briefly clean the inner part of the cassette. This step of removing the hairs is very important. Remember, we want to use the cleaning cartridge for as long as we can, so we don’t want the cleaning fluid overly contaminated with hair strands if we can prevent that. It only takes a few seconds but it will make a big difference. Note: Never use the cleaning station if your shaver is not free of any foam and soap residue. It should also be completely dry. 3. Use the cleaning station in conjunction with a quick manual cleaning. One of the reasons why I consider Braun cleaning stations necessary is that in time hairs, dirt, skin cells and gunk will remain lodged inside the cassette with obvious implications for the hygiene of your shaver. However, this will happen after months of use, so it’s perfectly fine to perform a few manual cleanings and use the station after every three shaving sessions for example. I find this to be a great compromise and I can always use the station whenever I feel that my shaver needs a proper cleaning. I recommend using a bit of liquid soap and warm tap water for a more efficient manual cleaning, but that’s up to you. Using only water or simply brushing the hairs are two quicker, but less effective methods. Also, since soap removes any traces of lubrication from the blades, make sure to apply a drop of clipper oil or sewing machine oil on each foil. This third step is of course optional and it’s for you to decide if and how often you’re willing to skip the automated cleaning process and clean the shaver yourself. I personally use my station once every three to four shaves and so far it’s been working great. How long can you expect a Braun CCR cartridge to last? 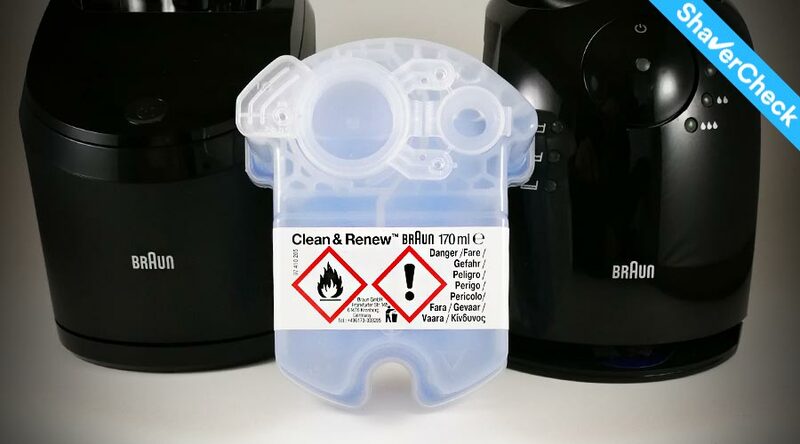 Well, that really depends on how often you use the cleaning station, but if you follow the above steps you should easily expect three to five months for one Braun CCR refill. Now, there are a few things to keep in mind. 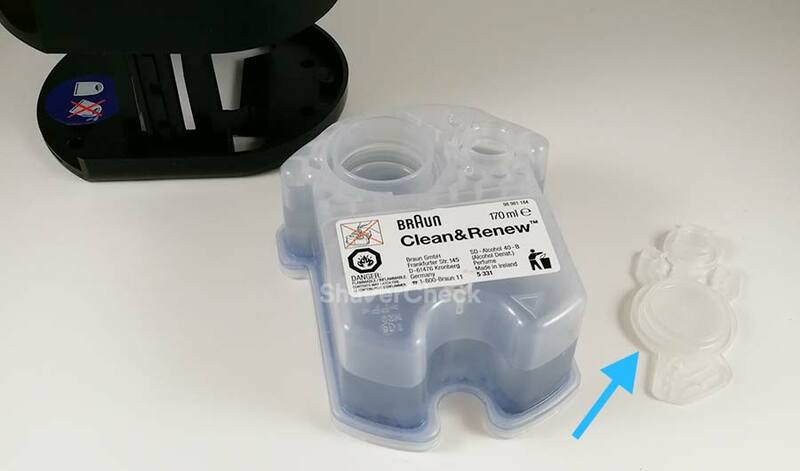 Braun officially recommends replacing the cleaning cartridge after two months once it has been opened and used (to maintain optimal hygiene). I personally have used the same cartridge for more than 5 months without any issues. Truth be told, I do have quite a few electric shavers in my rotation so I haven’t used the station as often as most users will. As long as the cleaning fluid is not overly contaminated with hairs and dirt to the extent of clogging the filter inside the cartridge and there are no buildups or funky smells, you should be good. As soon as you notice any of these it’s time to ditch the cartridge and get a new one. Speaking of which, buying your Braun refills in bulk seems like a good idea since the price per cartridge is more reasonable. There’s also the option of cheaper third-party refills or making your own Braun cleaning solution for significantly less money, but that’s a different topic that I’ll cover in great detail in a future post (I will update this one once it’s live). 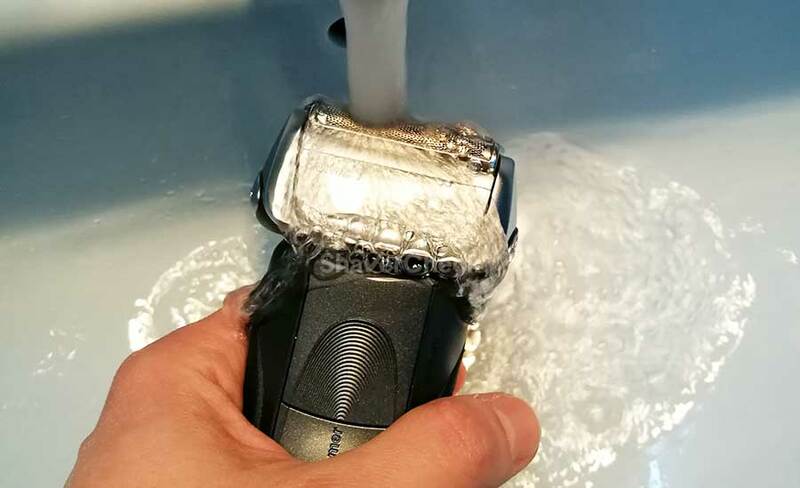 Disclaimer: shavercheck.com and the author of this post are not responsible in any way for any damage caused to your shaver by improper use. Always follow the instructions from your user’s manual. Yes, I always use a bit of liquid soap and warm tap water when doing a manual cleaning. You can turn the shaver on so that the soap will lather nicely. The procedure is described in detail in your shaver’s user manual. My Braun is around 3 years old, I use the clean and charge station once a week. I always clean it first with a brush and for the cartridge a brush and then a tap or 2 on a hard surface, foil side up, then a good blow through it. However I just discovered an amazing cleaning trick. I decided to completely flatten the battery before charging ( a good thing to do once a year). I removed the cassette first to save wear on the cutters. I then placed the shaver less cassette on its back (non button side) in the sink and just let it run. I came back 15mins later to find a sizeable pile of crud (a mix of fine shaved hairs and skin oil that was partly green -lovely!) underneath the shaver. More than one teaspoon full of this stuff. The shaver now seems to shave for longer on a charge. Thank you for taking the time to share your experience, those are really useful tips. This is excellent! I’m stationed abroad and ordering becomes a bit of a hassle. Thanks, heaps, for the longevity tips. When do you plan to hit us with your “make your own solution” post? Thank you for the kind words, greatly appreciated! I am still trying different things/ingredients to see what works best. I want to test the solutions for at least a couple of months before posting the article, so it will take a while. Walmart has isopropyl alcohol 50% and witch hazel (green) for about $2.00. I have recently retired my 5 series Braun razor after many years of trouble free service and have now replaced it with a 9 series Braun. I was a little disappointed with charger not having a coiled power lead which seems a little below Braun standards, I would like to use the charging unit from my old 5 series which has a coiled power lead, my question, is it compatible with the 9 series razor. The answer is yes, you can use the coiled cord with your Series 9. Braun switched to the flat cords some time ago and the coiled ones were discontinued. My charge station is faulty! after running a cleaning circle, liquid stays up, the shaver head stays wet, the only way to get rid of the water i have to unplug the charge station. I changed the cartridges and still the same fault. I had the same problem and it was caused by gunk blocking the drainage tube. Remove the visible gunk and then let hot water remove the rest until it free flows. 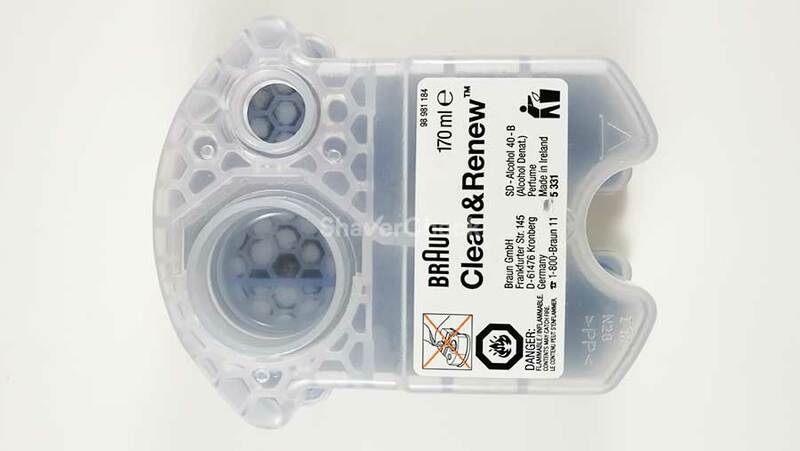 If that doesn’t solve the issue, you need to do some disassembling for further cleaning (eg, https://www.slideshare.net/OrganekLiving/drain-clearing-for-braun-clean-renew-bases). Use a wooden tooth pick to clear the clogged drainage hole, taking care not to let it fall into the base of the unit. Then rinse it through with some warm tap water and all should be well. This tip is now included in the Troubleshooting section of the user manuals. Hi, appreciate the information here. I just got off the phone with a Braun service centre because I felt my Series 9 cleaning station was prematurely asking to clean the shaver (it usually skipped the Economical program, & went straight to the Normal/High program, even after less than 20 minutes of use). It felt like my older series 5 lasted longer in comparison. They suggested I bring the shaver in to be looked at, but after reading this page, I feel there’s nothing to concern myself with. I’ll follow your tips above & hopefully get more mileage out of the cleaning fluid. I do have one question – is there a way to ‘reset’ the counter for the cleaning station? I ask because my current fluid can’t be used any longer as the red indicator is telling me to replace it, despite me not getting much use out of it. Could it be that the level of fluid is triggering the red indicator ie. too much fluid has evaporated? Thank you for your comment. That is actually a very common issue with the Series 9 cleaning station, it almost always selects the High-intensity program. I own two Series 9 and I am yet to see the station selecting the Short or Normal setting, even after a 5 minute shaving session. However, you shouldn’t worry too much about it since there’s only a minor difference between the three modes with regards to actually saving cleaning fluid. You cannot reset the station as it will always evaluate the fluid level and electric conductivity of the cartridge that’s inside the station. Based on that information, it will signal you to replace the cartridge. You may want to check out a third-party cleaning solution as they are much cheaper. Thanks for the third party recommendation. Unfortunately the seller doesn’t ship to Australia, so I may need to hunt around for one that does. I purchased Braun Series 5 5140S Wet and Dry . After reading this awesome website, I would like to use a cleaning station with it. I can’t seem to find any online to purchase. Can I not buy a cleaning station for this? Thank you for your comment. Series 5 cleaning stations are available online on sites like encompass.com or ebay, however your 5140S will not work with a cleaning station. That’s because Braun doesn’t fit Series 5 solo models (the ones ending in S like 5140s, 5030s etc.) with a special chip needed to communicate with the station. So if a Series 5 razor didn’t originally come with a cleaning station, it won’t work with one purchased later on. I just purchased a Braun 9295cc and the power cord is coiled. Thanks for the comment, I’ve heard that some of the newer shavers still come with the old coiled cord, but there’s no way of telling which ones until you actually open the package. 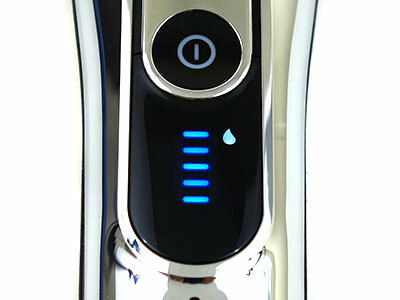 Do you know why the shaver needs to be dry before running it through the cleaning station? The reason I ask is I wanted to pre-clean first but then had to wait and wait for it to dry before running it through the cleaning station. Would be nice to just blow it out so its only damp after rinsing it in the sink then place it directly in the cleaning station? That dry part mainly refers to the shaver being free of any soap, lather and so on that can clog the station. However, excessive water (that ends up in the cartridge) may interfere with the electrical conductivity of the cleaning fluid which can lead to the station signaling a low cartridge level. A little damp would be fine I guess, so you can shake off the excess water, then gently pat it with a towel or a paper tissue before running it through an automatic cleaning cycle. The part around the metal contacts must be completely dry (for obvious reasons), so make sure to take all the necessary precautions. I personally don’t bother with a pre-cleaning so I just tap the cassette and shaver on the sink to remove most of the hairs. Not yet — just haven’t managed to get to it as I’ve been extremely busy. But it will come (hopefully a video as well). My Baum Clean and Renew 5651 for my Series 5 8985 has developed a problem in that when I start the cleaning process, it will continue to run until all cleaning fluid is used. The Auto-off function for the cleaning portion appears to have failed. Cant locate any troubleshooting/DIY for this issue. The charging function still works as advertised. Apparently Baum no longer makes this model of cleaner/charger and I can’t find what new model. Two questions, 1) is there a newer model Clean and Renew that is compatible with my 8985 or 2) How long is the cleaning cycle? I can do it manually. No, the newer stations are not compatible with the 8985. Your only options would be to try sourcing the 5651 cleaning station from sites like ebay or simply get a new Series 5 cc shaver (like the 5190cc). The cleaning cycle on those lasts approximately 3 minutes, sometimes even less (depending on the hygiene status of the shaver). Thanks! That’s what I expected. I’ll try manually timing the cycle for a while, if needed replace the shaver. After reading your reviews I finally decided to buy the Braun Series 9 (9290cc) with clean station. Here in AU / NZ (this is not a product endorsement – https://bit.ly/2QFWTzz) I use this product after I rinse with warm water for daily use and then I use the clean station once a week. I find the spray can works better for daily use as it has the lube / alcohol to clean the shave head and at the price it’s sold, is cost efffective on daily maintenance. Thank you for your comment. I also use a similar cleaning routine with my Series 9 and 7. Haven’t tried that particular brand (I doubt I can find it in Europe), but it looks like a really good product. You’re quite right, Ovidiu; the Barber Shop Shaver Guard spray is made in Australia and is not readily available in Europe. Importing it is prohibitively expensive. However, Braun ‘Shaver Cleaner’ is available in 100ml aerosol cans and pretty much does the same job as the Shaver Guard spray. It is available fragrance-free but also in ‘Lemon Fresh’ which has the same aroma as in the CCR cleaning cassettes. In the UK, it costs around £7.45 per 100ml aerosol. Similar products are available from other shaver manufacturers, e.g. ; Philips HQ110 Shaving Head Cleaning Spray is alcohol-based. It cleans and lubricates the shaver cassette components and has a ‘Cool Breeze’ aroma. It’s generally available for around £6.00 for a 100ml canister. German company, Collo, also offer the excellent ‘Scherkopf bad Sprüh’ (literal translation is ‘shaverhead bath spray’) which many barbers use for cleaning, disinfecting and lubricating shaver and clipper heads, and scissors. It costs around £7.00 for a 100ml cannister but shipping costs mean you’d be better to source it from your barber or Hairdressing Supplies centre. For those in America then Hampton Manufacturing’s ‘H-42 Clean Clippers’ blade cleaner is available in both spray-bottle and liquid form (in a jar). It cleans, disinfects (including viruses such as HIV) and lubricates shaver and clipper heads, scissors, razor and cut-throat blades. The glass jar version is great for soaking items in (similar to Barbicide in the UK) whilst the spray can easily be used like the Braun and Philips products, above. It costs around US$7.00 for an 8oz jar. An 8oz spray bottle of H-42 Clean Clippers costs around $10.00 but thereafter can be refilled from the jars. Alternatively, you may buy the jar and use your own prefered spray-bottle. Often overlooked, but used world-wide by barbers and in hospitals is Barbicide. This solution has been around since just after WWII. It cleans, disinfects and lubricates and is safe on metals and plastics. Not only does it destroy bacteria and viruses (including HIV), it also inhibits the growth of funguses. It’s very cost-effective for the professional or home-user as the concentrate is available in 2oz, pint, ½ gallon and gallon (60ml [bullets], 473ml and 1.89 litre) containers and merely diluted for use. It can be used in jars for soaking cutter-heads, scissors and combs, or you can put it into your own spray-bottle. For those who prefer to spray, more recently, Barbicide have made available their own 64 Fl.Oz spray-bottle with six 20z (60ml) ‘bullets’, one of which is put into the bottle then diluted with water. Not only can this be used to clean, disinfect and lubricate cutters etc but also used on hard and soft surfaces and for cleaning shaving-soap dishes etc. This is a tried and tested product used by barbers and healthcare professionals around the world for over 70 years. A 473ml (16 Fl Oz) bottle of Barbicide concentrate costs around £7.80. John, those are some fantastic suggestions. Thank you for taking the time to share them in the comments, I really appreciate it. Have you ever used a can of compresses air to blow out and clean the cassette on a Series 9? It seems it would be more effective than just blowing on it to get out those stubborn hair pieces. Also, when you manually clean with liquid soap and water, do you fill the sink up a bit with water, add a little liquid soap and then immerse the head of the shaver in the solution and run it for a bit? Or do you just add the liquid soap on top of the foils then run it under running water until the soap is gone? Compressed air would clearly work better than just blowing on the cassette, so if you have a can around definitely give it a go. As for the manual cleaning, this is my process: I add a few drops of water on the foils, then pour a bit of liquid soap on them. I turn on the shaver and let it run for around 20 seconds so the soap can lather nicely. I add more water if needed. After that, with the shaver still turned on, I rinse it under running warm water. I turn it off, remove the cassette, then rinse it thoroughly, both the outside and the inner part. For the shavers that don’t come with a cleaning station (particularly the ones from Panasonic), every 3 to 6 months I use something similar to your method described above. I fill a small container with warm water (the sink is way too large for this), then pour some dish detergent in it to make a soapy solution. I then put the foils and cutters in there and just let them soak for up to one hour. This is very effective for removing some hardened dirt and lather (I use shaving cream with most of my Panasonic shavers). Since most of my Braun shavers also have a cleaning station, I haven’t cleaned them in this manner, but it should work despite the enclosed design of the cassette. Question for those in the know. I just bought a 9265cc and everything i shave (not a lot of hair in my face) the shaver of course want‘s to get cleaned and the cleaning station always wants to do the high performance (3 droplets) cleaning program. I was assuming with that bit of shaving i do (done in a minute or 2) it would choose another program once in a while. Is that normal? Is there a firmware upgrade that i might need to go through? That’s actually what all Series 9 stations do, so there’s nothing wrong with your unit. The station always assumes that the shaver needs a thorough cleaning even after a very short shaving session. However, the differences between the three cleaning modes are negligible (even the high-intensity one lasts under 3 minutes), so you shouldn’t worry about it at all. Firmware updates can only be carried out in Braun service centers, but I doubt this issue is considered a problem that needs to be fixed. Thank you. I was assuming the high intensity one is going to empty the cartridge much faster than the other ones (and the scheme is just there to sell more cartridges). In that case i just ignore the “cleaning hint” and clean the shaver once a week using the station. I have the same issue.. My Series 9 show de indicator asking for a cleaning after only few minutes of use..even if the machine is only power on without performing a reall shaving. I need to know if this is a problem?. It’s not a cleaning station issue, because is the Shaver indicator. I wouldn’t worry too much about it. 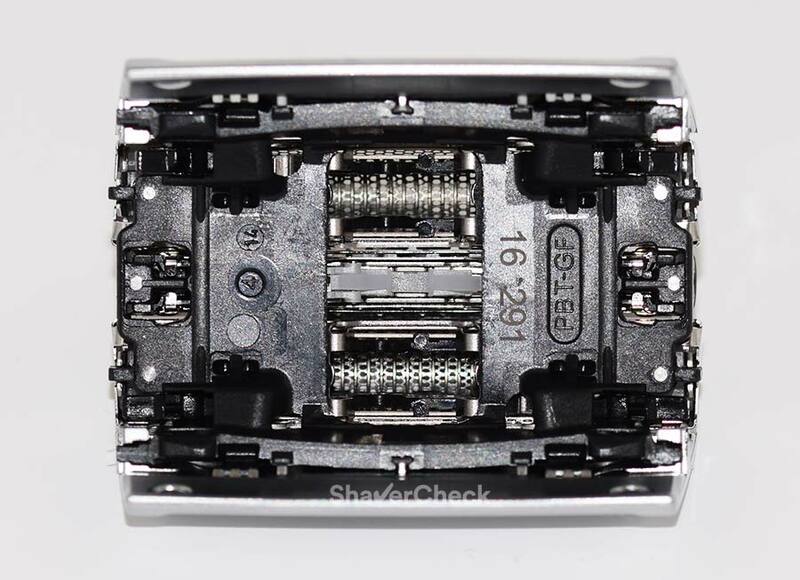 The hygiene indicator on the Series 9 doesn’t really measure how dirty the shaver is; it only accounts for how long it has been turned on since the last automatic cleaning, regardless if you’re shaving or simply turn it on and let it run. Mine also shows the cleaning indicator pretty quickly and I simply ignore it. Great articles. You helped me decide on a Braun Series 7-sensitive skin and some flat neck hairs. I shave dry. Is one able to perform a manual clean with soap and water on the 790cc model? Or would the 7865cc wet/dry be required for this cleaning task? Thank you for your comment, I’m glad you found the information useful. The answer is yes, you can definitely clean the 790cc with water and soap. Despite being marketed as a dry only shaver, it is in fact waterproof, so a manual clean is perfectly safe. 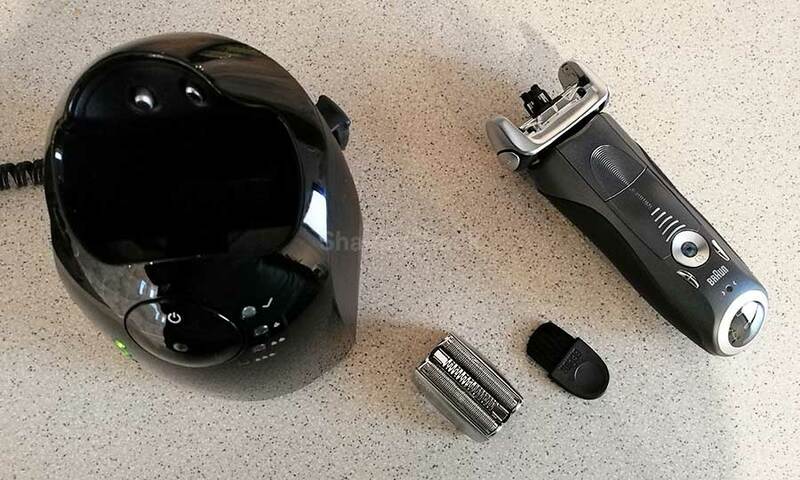 No, the Series 7 station will not work with a Series 9 shaver. In fact, not even a Series 9 station will work with a Series 9 solo shaver (one that didn’t originally come with a cleaning station). The hair will be collected inside the cartridge, not in the station itself. You should only clean the drain hole of the station if it gets clogged with dirt. The cleaning cartridge can be disposed of with regular household waste. I’ve been using a new Braun 799cc-7 for the past couple months for dry shaving, on average every two days, cleaning it manually under running water after each shave but only running the cleaning station once every 3 shaves. The problem I have is that even a couple of days after manually cleaning it, the shaver head is still not completely dry and this obviously interferes with my dry shaving routine. I “shake” it well after the clean to get rid of water droplets but I guess it’s not enough. 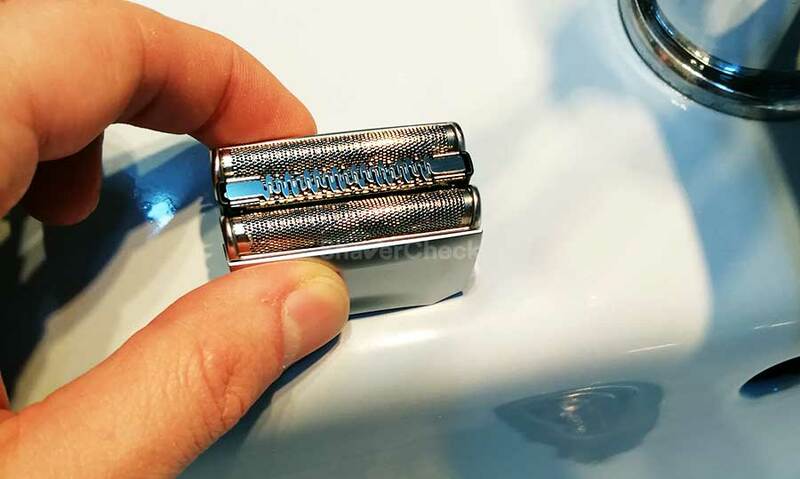 So, anyone else here who shaves dry and manually cleans the shaver, can share insight on how to get it completely dry in time for the next shave? I felt I was beginning to spend a lot in cleaning cartridges and so there are some great tips on this site, particularly putting the cap back on the cartridge after use, makes perfect sense. Also only using the cleaning station once every three shaves or so, (instead of every day as I have been, in accordance with the guide lines set by Braun) is another good tip. Thank you so much. Having said all that I am new to braun, I bought one of the 9 series about two years ago and the shaving experience is excellent giving a really close shave. Hope I do not sound too geeky! Thank you for taking the time to comment, I really appreciate it. Glad to hear you found the information useful.